I’m a huge believer in chemical exfoliation, but my skin is so weird about Alpha Hydroxy Acids sometimes. Lactic acids are generally pretty safe for me, but glycolic acid can go either way. Sometimes they work like a dream, and sometimes I wind up with chemical burn, or never-ending skin flakes for what seems like no good reason at all. The thing is, I love what AHA does for my skin when it works, so I remain persistent. After my success with Paula’s Choice 2% BHA Liquid, I figured if any AHA was going to work for me, it would be a Paula’s Choice formula. 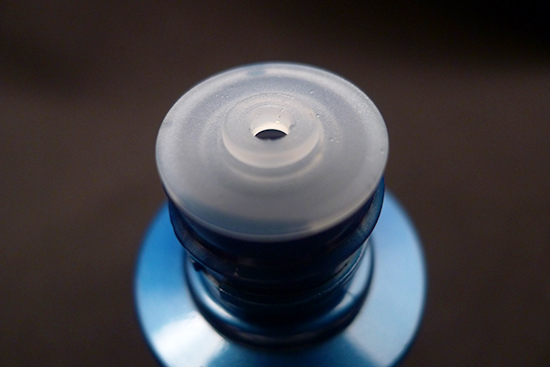 I tried the 8% AHA first, and it was a flake festival no matter how I used it – I tried it with and without BHA, I tried it every other day and even every 2 days, but no matter what I did, the days that followed always ended with a full beard made out of dead skin by the time 5PM rolled around. I was almost ready to give up on glycolic acid altogether, but thankfully I didn’t, because then I never would have discovered Paula’s Choice RESIST Weekly Resurfacing Treatment. Alpha Hydroxy Acids (AHAs) are plant-derived acids that, when formulated with the correct pH and concentration, exfoliate the surface layer of skin and promote healthy cell growth to replace dead skin cells. AHAs are great for refining skin texture, lightening dark spots, and they’re one of the few skincare actives that have substantial scientific proof demonstrating their efficacy against fine lines and wrinkles. They do have a dark side though – an AHA that’s too strong can damage skin. 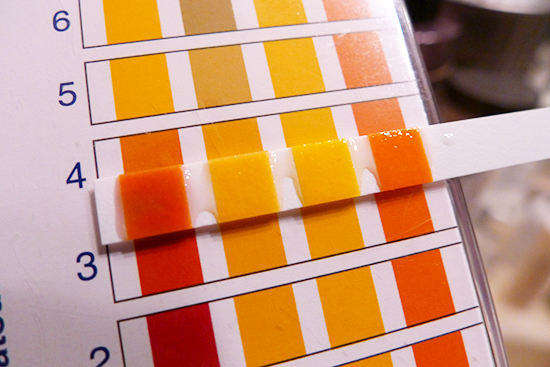 If it’s not formulated with the right pH (3.4-3.8), it won’t do much of anything at all. Some AHAs don’t play nicely with sensitive skin types – I remember trying to use an AHA back when I first started using a prescription Tretinoin cream – big mistake. Huge. My skin is less sensitive than it used to be though, so my love affair with AHA is back on. I’m in a pretty serious relationship right now with a high-end lactic acid toner I started using a few months ago (review forthcoming), but I need more. That’s where the Paula’s Choice RESIST Weekly Resurfacing Treatment comes in. 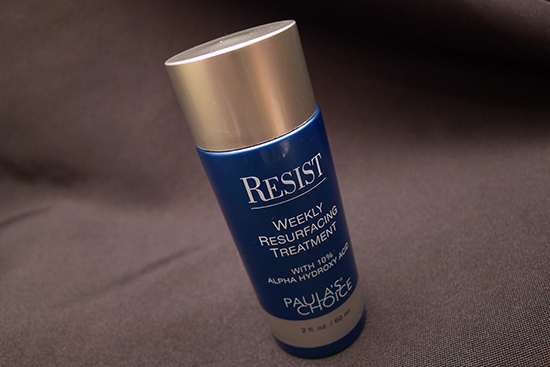 Paula’s Choice RESIST Weekly Resurfacing Treatment ($30) is a 10% AHA (in the form of glycolic acid) treatment that promises to even skin tone, brighten skin tone, stimulate collagen production, and reduce wrinkles. Water, Methylpropanediol, Glycolic Acid, Butylene Glycol, Aloe Barbadensis Leaf Juice, Sodium Hydroxide, Camellia Sinensis (Green Tea) Leaf Extract, Sodium Ascorbyl Phosphate (vitamin C), Dipotassium Glycyrrhizate, Glycyrrhiza Glabra (Licorice) Root Extract, Vitis Vinifera (Grape) Seed Extract, Arctium Lappa (Burdock) Root Extract, Avena Sativa (Oat) Kernel Extract, Borago Officinalis (Borage) Extract, Boerhavia Diffusa Root Extract, Chamomilla Recutita (Matricaria) Flower Extract, Lamium Album (White Nettle) Flower Extract, Salix Nigra (Willow) Bark Extract, Salix Alba (Willow) Bark Extract, Ulmus Fulva Bark Extract, Glycerin, Allantoin, Propylene Glycol, Tetrasodium EDTA, Phenoxyethanol. Glycolic acid is a sugar cane derived Alpha Hydroxy Acid that acts as a chemical exfoliator. It works by removing dead skin cells to reveal and promote the growth of newer, healthier cells. It’s used to treat fine lines, hyperpigmentation, melasma, and dullness. Aloe is a classic skincare ingredient for very good reason. It contains antioxidant properties with Vitamins A, C, and E, fatty acids, anti-inflammatory and antibacterial properties, as well as naturally occurring salicylic acid. It’s fantastic at treating acne, redness, and dryness, among other things. If you’d like to learn more about aloe, check out this wonderfully detailed summary from the Indian Journal of Dermatology. Green tea has a multitude of studies showing its skincare benefits. Its active, skin-friendly component is polyphenols, which possess powerful anti-inflammatory and antioxidant properties. Licorice Root is one of my all time favorite skincare ingredients. It’s often used in skincare formulas for it’s brightening properties and its ability to lighten hyperpigmentation, but it’s also anti-inflammatory, antiviral, and antimicrobial. According to CosDNA, the only real red flag in this ingredient lineup is Sodium Hydroxide, which ranks a 5 out of 5 as a potential irritant. It’s worth noting, however, that this score reflects the properties of unreacted Sodium Hydroxide. In this product, it’s used as a pH adjuster. Because it’s been reacted, it is 100% benign in this formula. 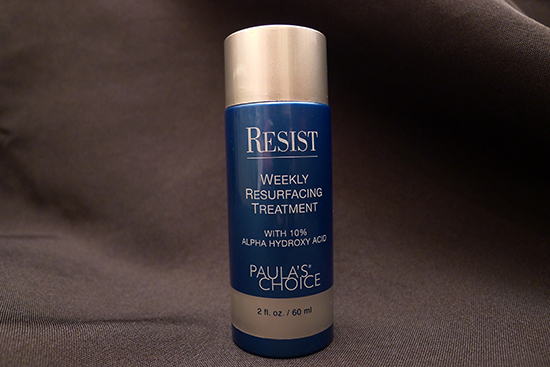 Paula’s Choice RESIST Weekly Resurfacing Treatment comes packaged in an unceremonious, yet adequately functional blue, plastic bottle. The dispenser is just a standard shaker opening. The product itself is a clear liquid that’s a bit thicker than water. The ideal pH for a glycolic action to work effectively without causing irritation is between 3 and 4. Some clinical peels are administered with an even lower pH, but once it dips below 3, chances of irritation or skin damage increases. Paula’s Choice RESIST Weekly Resurfacing Treatment has a pH of right around 3.5. There will never be an eau de parfum paying homage to the smell of this treatment. This product smells like nail polish remover. It is not overpowering though, and it does not linger. When I use Paula’s Choice RESIST Weekly Resurfacing Treatment, I pat my face dry after cleansing in the evening, and pour out an amount approximately the diameter of a cherry into my hands. I spread the liquid over my face with my fingers, and then quickly rinse my hands (I don’t want peely fingertips). Then I wait for about 20-30 minutes while the acid does its work. This product definitely has the characteristic acid “tingle.” It feels a bit like my face on a super low-powered electric fence. I’ve grown to enjoy it, but those new to acids might find it too uncomfortable. If you do, it’s okay to wash it off. You might learn to love it later – it’s an acquired taste. After I’ve waited, I apply the rest of my skincare routine, but omit my Tretinoin and BHA. The instructions indicate that you can wash it off it you’d like, but I don’t see the point. By the time 30 minutes has gone by and I’ve applied other products to my face, the pH has been neutralized. Besides, washing it off would deprive me of all those exciting anti-inflammatory ingredients I’m always blathering on about! 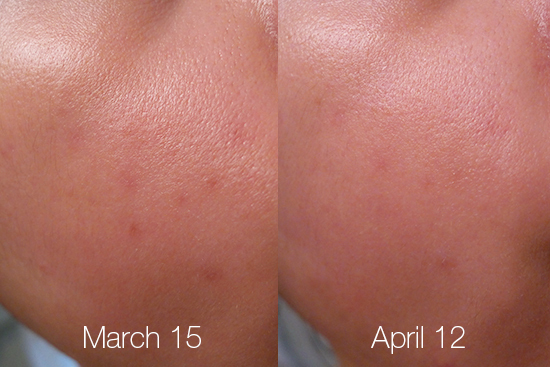 I used Paula’s Choice RESIST Weekly Resurfacing Treatment once a week for 4 consecutive weeks. I did not experience any breakouts or irritation as a result of using this product. For the first two weeks, I was also using the Hanyul White Chrysanthemum Powder Serum, so keep that in mind when viewing the before & afters. I found the effects of this treatment to be both instantaneous and long term. In the short term, my skin had a little extra glow the day after using this treatment. The texture was smoother, and pores were less visible. Over the course of 4 weeks, my PIH lightened significantly. Best of all, flaking was minimal – I flaked a little a day or two after the treatment, but nothing on the magnitude of dead skin I often experience with other glycolic acid treatments. I’m incredibly impressed with this product – I love that I get all the benefits of AHA without any of the drawbacks. My skin type is dry, but I think it would work well on normal and oily skin as well. I consider my skin to be sensitive, though not as sensitive as it used to be. I think this is an excellent treatment for those new to acids, or for people who have had issues with AHAs in the past. I will definitely buy this product again. I’m glad you liked this one so much; it makes sense you took a break from the tretinoin and the BHA when you used this. I haven’t heard of that Skin Authority one before. I’ll have to check that out! Where do you get yours? I got my Skin Authority Resurfacing Accelerator online, but some spas carry their products too. I didn’t think there was one local to me, but it turned out there was. I’ll include the link so you can see what states they have spas (then you can click on the state to see if there is a location accessible to you). The main reason it’s a special product for me is it helped my skin a lot at a time when it was at its worst (acne-wise) and sensitive. It might have also even been my gateway into having hope that I could find good skincare 🙂 And if my skin were really bad and I was forced to choose only one product, I’d probably pick this one. I first tried it February of 2013. All that said, I generally like to save this product for when my skin is worse. My skin seems to like Glycolic Acid more than other acids. So I’m always trying to incorporate that ingredient at some level. When I don’t, my skin seems to miss it. This next link I’ll share was an unexpected more recent find at a Rite Aid for half price. I felt lucky it didn’t disappoint me. I find it more gentle than the Paula’s Choice glycolic liquid one, but I’m not sure of the pH. I ordered my first sample of the Paula’s Choice glycolic liquid one and a full-size back in May 2013. There was a discount on the RESIST line at that time. I finally feel like I’m making progress on using mine up. I can’t tell if I have about 1/2 the product left or a bit less. I’ve been trying a new routine with it in it and am able to use it more than once a week. This product looks so promising! I have some incredibly dark and stubborn post acne hyperpigmentation marks that have been around for months. I’ve been using the Mario Badescu Vitamin C serum and Mario Badescu Glycolic Acid Toner for months to no significant effect on my dark spots. I’ve also been using the Peter Thomas Roth Glycolic Acid 10% Moisturiser on and off for almost a year and while it’s great for smoothing out my skin it doesn’t seem to make a difference in my dark spots either. I know what you mean, Bebe! My PIH tends to linger for months on end, and it’s really frustrating. I don’t think you’re crazy for wanting to add another strong product. The nice thing about this treatment is that it’s only a once a week situation, and you’re supposed to skip the other strong stuff on the day you use it. What do you think of PTR 10% Moisturizer? 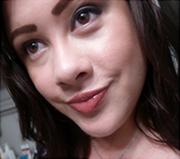 Hi Bebe, was going through the same thing, has HIP several shades darker, drove me crazy. I tried alot of product including PTR, but it didnt work for me. Let me know if you would like to see my full skincare routine. Hope this helps. Hey Charlotte! Where did you find your Sure White Serum? I got it from a beauty store but it is available on Amazon :-). I am about to order the Paula Choice Resurfacing Treatment, I like that it does not irritate. I tried PTR Glycolic Hydrating gel and it was a peel-fest, and I do not have sensitive skin. I tried Avon’s Glycolic Peel Pads, its not too bad. I really wanted to order your lactic acid toner, but can’t find it online. Do you know where I can get it? Hey Charlotte! The lactic acid toner I’m using is actually from another brand, Biologique Recherche. The toner is called P50. There are several different types of P50. I’ll be reviewing it in about a week and will break them down then. If you want to try ordering it before then, I would recommend contacting Rescue Spa or Vick Morav, and asking someone there which P50 is best for your skin type. I’d also personally recommend that you choose one of the “new formula” versions without phenol (I’ll talk about why in my review). Kerry, will wait for your review before I get it. Do you think the Paula’s Choice RESIST treatment would be ok to use in place of the Avon pads? Being from Australia, I can’t order cosmetics off of Amazon unfortunately. I actually like Paula’s Choice over Avon pads after reading Kerry’s review, as it has 10% glycolic acid as well. You just need to get a textured pad to rub on the the darker areas.I tried other glycolic products but it was only Avon that made a difference as it had a textured pad. So sorry to hear you cannot order from amazon :-(. You could also try using one of those mail forwarding companies like bongo, if the cost is reasonable. Hope this helps. You can try w2 beauty and sasa for the korean brands. Also just wanted to add the Glycolic treatment should tingle, if it doesn’t then that means you need something stronger you can either go up to 15% or add a 5% glycolic moisturizer to your routine. Once, my hyper-pigmentation is done, I will stop using the daily glycolic treatments and brightening serum and maintain my skin with Vitamin C serum, weekly glycolic treatment like Paula’s and SPF 50 Sunscreen. I’d love to try it because have so many acne marks and my skin doesn’t help too, but seems they don’t ship to Chile :/ and the price doesn’t seem expensive for the results. Do you know what brand could I try? Doesn’t matter if its a korean brand, I’d love if it is. Hi Evelyn! Paula’s Choice doesn’t ship to Chile? What a letdown! Yes, it’s sad because here we have many brands that promises heaven and earth at ridiculous high prices and the products are bs. That’s why I started with korean cosmetics. Btw, Do you know about anyone who had tested the syn-ake version of It’s skin 10 power formula serum? Hi, I’m using the Paula’s Choice 2% BHA and the weekly 4%BHA at the moment. Do you think there would be any benefit in adding this to the regimen? Thanks! Hi Jess! I do! I also have the 2% and 4% BHA treatment and have noticed that this AHA treatment has different results. I would describe the BHA treatments at being more visibly effective for oil and acne, and the AHA as having a more visible effect on dark spots/PIH, and overall dullness. I think they both do a great job reducing pore appearance and improving skin texture. Good to know. I’ve got some spots I’d like to get rid of too! Just to clarify, do you use the 4%BHA and this AHA at the same time, or are you giving the BHA a rest whilst you use this? Thanks again! Hi Kerry! thanks for responding your so nice! I live in NY, USA and ordering products online would not be a problem for me at all. I love your reviews on shea terra products ( the after sun crème looks interesting to me since it lightens dark sun spots have you tried it ?- as long as its not greasy and break out prone haha ) Thanks! Just bought this treatment. It’s on sale right now for $25.50…so with the $10off code I paid $18 including shipping. I’m excited to try this! 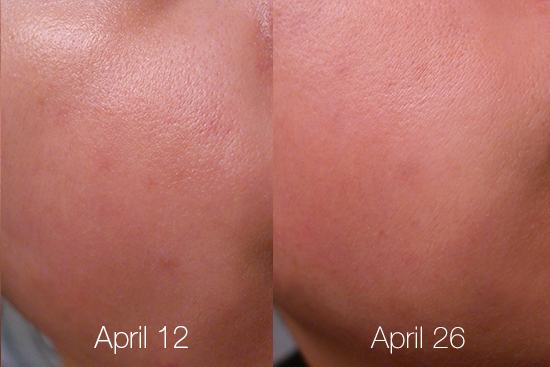 It even seems like your pores reduced which is what I am trying to do plus get rid of some hyper-pigmentation. Hi Hajar!I think you’d be okay with this product, but you might want to leave it on for a shorter period of time the first couple of times you use it – try 5 minutes the first time, 10 minutes the second time, and build up from there. Be sure to pay attention to the way your face feels – if the acid tingle is too uncomfortable, wash it off. Since you haven’t tried any AHAs before, patch testing is extra important. To patch test, put a little bit of the product on your jawline, preferably close to your ear. Leave it on for the amount of time you would normally leave it on your face, then wash it off. For the next 24 hours, keep an eye out for any redness, swelling, or other signs of irritation. If you don’t see any, you should be okay. The Paula’s Choice website does sell samples, so you can make sure it will work for you before you invest in a full size. After reading this review and re-reading your review on the Hanyul White Chrysanthemum Powder Serum I did a total impulse buy and bought the Hanyul Serum. I definitely have more of the sensitive skin type so I thought that this would be a good option to brighten my skin tone from the dull winter look as well as get rid of the hyper-pigmentation I get from hormonal acne. I do have my eye on some PC products so this will be on my wishlist next. Although I did try out their RESIST BHA 9, but it didn’t really work at all on my blackheads like I read it would. I find that the combination of Benton’s Serum, Shea Terra’s rose hips and black soap, as well as tamanu oil works best for those little buggers. Now just to find those products for hormonal acne. P.S. I’m in love with your new layout and rating system! I really like the BHA 9, but I use it on active acne spots and/or closed comedones. I fortunately haven’t had any blackheads to try it on. Bethany, read up on DIM. It really reduces (and in most cases totally eliminates) hormonal acne. I absolutely swear by it. The one I take is called EstroBlock Pro. I’ve also taken Pure Caps DIM Detox and that works well too, but for my body in particular, the former works best. See which works best for you, but I definitely recommend you give it a shot. P.S. Bethany – I recently came across your site and you are fantastic. I love how thorough and witty you are. Amazing work! Thanks for this review! I have the 8% AHA as well, but while it doesn’t seem to have a terrible reaction to my skin, I really loathe the feeling of the gel and prefer a watery texture. It’s awesome that this can have such a dramatic effect if you do this weekly! I might have to add this to my list of products that I need to try. The new layout looks so beautiful, and I like how you have an informative PH section in your review! I also love that the newsletter actually emails you about your new posts, because sometimes I miss the updates on FB. This treatment definitely doesn’t feel like the gel – but it’s not watery either. I think it feels like a serum, in terms of viscosity. It absorbs more quickly than the gel does but not as fast as a watery product would. Totally not weird that you like that feeling! I like it too. It feels like transformation! Let me know how it works out for you when you try it! AHAs are so wonderful when they go right, and such a nightmare when they go wrong. Hi Antara! I’ll tell you the same thing I told Hajar – I think you’d be okay with this product, but you might want to leave it on for a shorter period of time the first couple of times you use it. You can try 5 minutes the first time, 10 minutes the second time, and build up from there. Pay attention to the way your face feels, and if the acid tingle is too uncomfortable, wash it off. Patch testing is extra important. To do that, put a little bit of product on your jawline, close to your ear. Leave it on for the amount of time you would normally leave it on your face, then wash it off. Keep an eye out for any redness, swelling, or other signs of irritation over the next 24 hours. If you don’t see any, you should be okay. I just purchased this based on your recommendation. I was leaning towards Avene’s Retrinol or drug store Alpha Hydrox, but your photos are so convincing and I’m battling the same concerns. The discount was the final push off the cliff. I hope you love it KN! 🙂 Avene also has an AHA/BHA treatment I want to try called Cleanance K.
First and foremost, love the site, and especially your new review system! I use them both together, but I had to wait nearly a year after starting Tretinoin before I could use any acids with it. Switching to a time release formula of Tretinoin helped quite a bit in that area too. But if I had to choose one or the other? I think I’d actually choose BHA & AHA over Tretinoin! I like that I can vary the strength and delivery mechanism based on what my skin is like on any given day. I also think acids are better at imparting that overall glow effect, and AHA is definitely faster when it comes lightening PIH. Thanks for the response. That’s interesting actually. I know some people say Tretinoin is their HG product, but maybe I just haven’t used it right in the past, and scared the heck out of myself for it! When my Sunscreen comes in (Hada Labo UV Moist Emulsion SPF50+ PA+++) I would love to start an AHA as well! If you had to alternate, would you switch between the two daily? i.e. : Day1: BHA, Day 2:AHA, Day 3: BHA etc..? Hmmm. Would I switch between them? Right now I’m not – I’m using an AHA toner twice a day, a BHA 2% treatment once a day, Tretinoin every two days, and a 10% AHA treatment once a week. I’ve tried incorporating a stronger AHA (8%) in addition to my AHA toner in the past, and alternated with the BHA, but it made my face flake like crazy. I think the AHA toner, BHA treatment, and weekly AHA treatment is my sweet spot for acids. I will say, I don’t think my face could have handled a daily AHA toner and a daily BHA treatment when I was using the Tretinoin cream. When I first started the cream, my skin became insanely sensitive. After a year of using the cream, my skin was less sensitive than when I started it, but still far more sensitive than it is now with the Gel Microsphere/time-release version of the Tretinoin. And you’ll be happy to know I have multiple sunscreen reviews coming in the near future. I’ve tried some new ones in the past few months, and just need to write them up! This is on my list to buy ASAP!! Can’t wait to try it! Thanks for the review! Have your tried other PC’s products like the C15 Booster and Retinol Treatment? Would love to hear your thoughts! I would love to try out all these HG products from PC, but I live in HK and their website for our region is basically entirely unuseable for Hong Kong (language issues, confusing currency issues and even more confusing payment paypal issues). My friends and I have emailed them on it previously and their reply was basically “yeah, we’re not going to anything about that!”, which was rather infuriating and honestly kind of turned me off the brand. Thanks so much for exposing me to this wonderful product. My skin loved it so much that I use it three times a week and have no irritation. I’m so into this acid that I’m going to try something stronger once I finish this bottle. I’ve been eyeing this stuff for my next product, http://www.makeupartistschoice.com/25-Mandelic-Acid-Peel_p_26.html Have you used it? I do have very resilient skin that needs a lot of exfoliation, and really love using a chemical instead of a physical exfoliator, for some reason I find scrubs more irritating! I am using it for years. I never wait for 20 min after applying, I don’t feel it is necessary, Paula wrote an article about it a while ago, saying that there is no need to wait a certain time between the products. I will try to wait a bit to see if it makes any difference. When I want some extra peeling effect, I apply a peter Thomas Roth glycolic acid 10 hydrating gel on top of it, add eye cream and go to bed.